The Fixed Tool Pallet used in the Midwest Rapid Tool Automatic Tool Changer has Tool Bays for eight Tool Holders. Each Tool Bay has round nosed spring loaded pins which hold the Tool Holder firmly in place using the groove machined into the Tool Holder. The Tool Pallet is mounted on the side of the tables parallel with the Y axis. Individual Tool Bays are also available and can be mounted anywhere on the table or used to make a custom Tool Pallet. To pick up a Tool Holder the Tool Changer is aligned over the Tool Holder and lowered to a position just above the Holder. The drawbar solenoid is actuated a few times to blow off any debris on the Tool Holder. The solenoid is actuated once more and the gripper fingers on the drawbar extend. 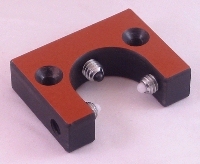 The Tool Changer is lowered over the Tool Holder with the gripper fingers over the pull stud of the tool holder. The solenoid is deactivated. 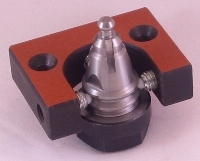 As the drawbar is retracted ,the gripper fingers grab the pull stud on the Tool Holder and pull the Holder securely into the taper of the collet chuck on the Tool Changer. To replace a tool, the Tool Changer is positioned to the correct height just outside the tool bay. The Tool Changer moves into the Tool Bay and the Tool Holder is captured by the spring loaded pins. The draw bar is actuated, releasing the Tool Holder and the Tool Changer is lifted, leaving the Tool Holder properly positioned in the Tool Bay ready for the next pickup. All Midwest Tool Pallets and Platforms are made from Phenolic sheet. Phenolic is a hard, dense material made by applying heat and pressure to layers of cellulose impregnated with synthetic resin. When heat and pressure are applied to the layers, a chemical reaction (polymerization) transforms the layers into a high-pressure thermosetting industrial laminated plastic. Phenolic is lighter than steel but dense and strong and is moisture stable. Meets UL 94HB for flammability and Mil. Spec. MIL-I-24768.